The ultimate WWE crossover! WWE Superstars of today and WWE Legends of the past engage in insane battles across the WWE Universe. 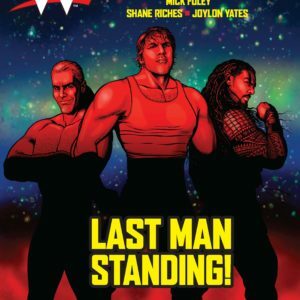 From Daniel Bryan to “Stone Cold” Steve Austin, from Hulk Hogan to John Cena, from Undertaker to the Rock they’re all here in one awesome graphic novel! The ultimate WWE crossover! WWE Superstars of today and WWE Legends of the past engage in insane battles across the WWE Universe. From Daniel Bryan to “Stone Cold” Steve Austin, from Hulk Hogan to John Cena, from Undertaker to the Rock. All these Superstars and more are forced into constant combat — all while trying to figure out how and why they find themselves in constant mayhem across a myriad of bizarre battlefields. But just when they think they know the answers, one superstar changes all the questions: The Hot Rod, “Rowdy” Roddy Piper enters the fray!